Attendance Types define the parameters of the ‘class’ such as the age or grade range. Each Attendance Type must have one or more frequency, which defines the specific time that attendance type is active. You can assign a group or tag to an Attendance Type, indicating the occurrences are created for the attendance type. Frequencies determine the availability of the Attendance Type. An attendance type can only be associated with a single group or tag, but a single group or tag may have multiple attendance types assigned to it. When managing a large number of attendance types, setting the frequencies and labels for each attendance type can be time consuming. Consider setting frequencies and labels at the Attendance Type Category level. 1. From the Check-In menu, click the Attendance Type Categories option. 2. Click the Add New Attendance Type Category icon. 3. Complete available fields, as desired. •Category Name – Enter the name for this category. •Report Form – Enter the default begin date for this Attendance Type Category. The date value you enter applies when displaying the Attendance Type Category chart and attendance data. •Report Through – Enter the default end date for this Attendance Type Category. 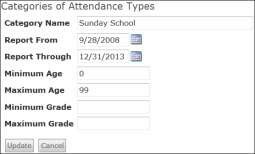 The date value you enter applies when displaying the Attendance Type Category chart and attendance data. •Minimum Age – Enter the minimum age for this Attendance Type Category, if applicable. If there is not an applicable age range, enter “0.” You can use either Age or Grade, not both. •Minimum Grade – Enter the minimum grade for this Attendance Type Category, if applicable. •Maximum Grade – Enter the maximum grade for this Attendance Type Category, if applicable. You can use either Age or Grade, not both. 4. Click the Update button to save the settings. Click the Edit icon if you need to change the details of a Category. Click the Delete icon to the delete the category. To delete an Attendance Type, you must first delete all associated Occurrences, Labels and Frequencies. 5. You are now ready to create Attendance Types. •Category Name – This column displays the name of the Category. •Report From and Through – These columns display the date range for the category. •Minimum and Maximum Age – These columns display the age range for the category. •Minimum and Maximum Grade – These columns display the grade range for the category. •Labels – This is the link to labels for the category. •Frequency – This is the link to frequencies for the category. •Attendance Types – This link is to the Attendance Types associated with the category. 6. Click an Attendance Type Category link to display metrics for Check-In. 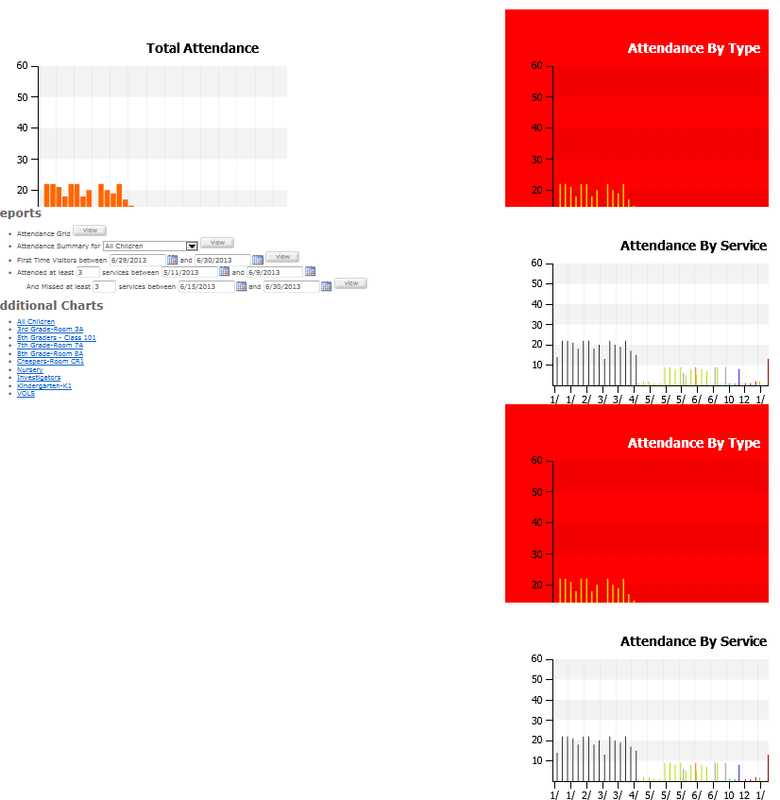 You can also click the links for Additional Charts to view Metrics for a specific Attendance Type. You can access Attendance reporting by clicking the Category Name link on the Attendance Type Category page. Attendance Grid – Displays a grand total of attendees per class. Clicking the Number link displays the records of those who were present. Attendance Summary – Displays a grid of the dates this Attendance Type Category met, and the attendance records of the members. First Time Visitors – Displays the records where the first visit date falls between the date ranges. Missed at least and Attended at least – Displays the records meeting the supplied criteria.